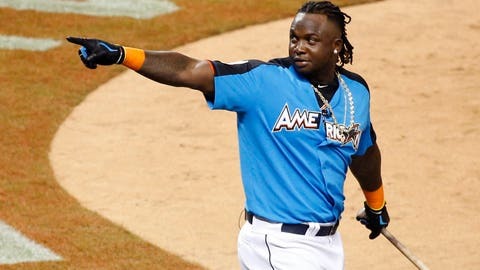 Miguel Sano points to fans during his run to the 2017 MLB Home Run Derby finals. Fresh off an All-Star weekend that displayed his power on a national scale, Minnesota slugger Miguel Sano is back in the Twins clubhouse. A clubhouse that Sano leads in four major statistical categories. The 24-year-old third baseman is on pace to become just the fourth player in Twins history to lead the team in hits, runs, home runs and runs batted in. Twins fans might remember Brian Dozier achieved the feat last season when he blasted 42 homers in an otherwise forgettable year. Kirby Puckett was the second Twins player to do it in 1992, just under a year after he “drove the Twins bus” to a World Series title. The first? Infielder John Castino, who spent six seasons with the Twins from 1979-84, led the club with a .302 batting average to go along with his crowns in the same four categories. Last year, the Twins won seven of the final nine games before the All-Star break, but they still were well out of contention with a 32-56 record. This year, Minnesota stands at 45-43 and is a legitimate contender to make the postseason for the first time since 2010. Just the Arizona Diamondbacks have seen a better turnaround from last year, improving from 38 wins in the first half of 2016 to 53 wins so far this season. Despite its hot start, Arizona still is 7 1/2 games out of first place in the West. The Twins, meanwhile, are chasing the tails of Kansas City and Cleveland, just 2 1/2 games back. A rocky schedule in July will give the Twins the chance to prove to their fans – and the entire MLB – that they’re serious contenders. Minnesota visits the Astros, hosts the Yankees and travels to Los Angeles to face the Dodgers for three games apiece. All three teams currently hold a playoff spot, with the Astros and Dodgers fighting for the best record in baseball. Jose Berrios (8-2) toes the rubber for the Twins in the series-opening game against the Astros on Friday night. His eight wins are tied for the highest in MLB since May 13, along with some names you might be familiar with — Clayton Kershaw, Chris Sale and Adam Wainwright.